Join us for AishLIT’s first official weekend getaway! 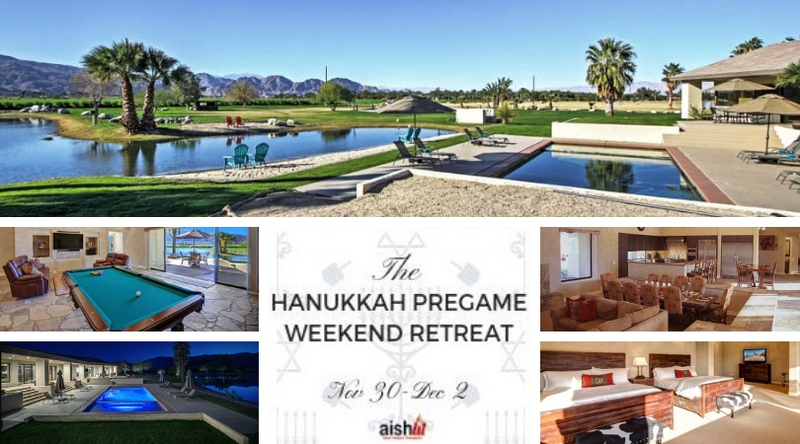 Get in the Hanukkah spirit with this very special retreat filled with friendship, learning, bonding, relaxation, and lifelong memories. Located in the Coachella Valley with views of the Santa Rosa mountains, we are renting a stunning mansion that is spacious and provides all the luxuries. The 40-acre property is equipped with a pool, Jacuzzi, private lake, pedal boats, kayaks, pool table, Foosball, and much much more! The weekend is ALL INCLUSIVE (highly subsidized thanks to generous donors) – meaning that your payment will fulfill all housing, food, and entertainment needs. We will kick off the trip with a meaningful Shabbat together Friday night and spend the weekend connecting to Judaism and to each other – while having an incredibly fun time! We only have **20** spots available and have seen a very high interest expressed so far, so please be in contact immediately if you are serious about joining us. We are so excited to share these memories with you in our very special first ever weekend retreat! As always, reach out if you have any questions. See you under the night sky in the desert! *Please reach out to Rabbi Jack and Shira Melul if you have any questions.